So today I got a “leaflet” in the post telling me all about the wonderful work of my local MP. Bob Neill. I’ve never had the misfortune of meeting him, I think this is for the best being arrested for GBH maybe look wrong. So I calmly read the “leaflet” and can’t help feeling sorry for Bob he’s clearly ill! His lies are clearly having a toal. I emailed Bob Neill on 13 November 2012 15:02 on 27 November 2012 13:10:16 I got a response from Vanessa Michna using Bob Neill’s email address. In my email, I talk of making a formal complaint, the CQC & ICO. This indicates I’ve got a little common sense. Vanessa Michna response was patronising. And I have no idea if Bob Neill saw my email. Mr Neil is against free Speach & not supportive of less fortunate people. So clearly Mr Neill hates being exposed as a rat. I could attend his advice surgeries how ever this poses another set of problems, such as disabled facilities at the venue. 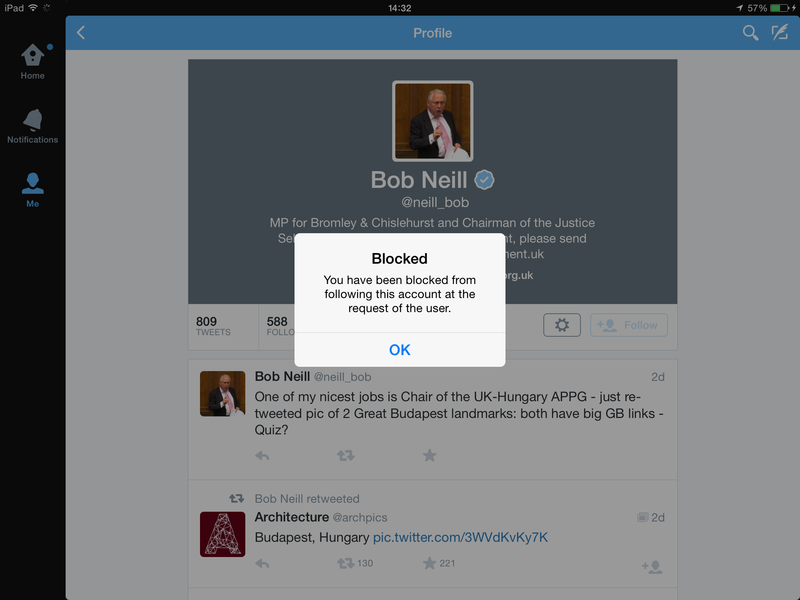 I’m not sure but “blocking” a constituent is not very democratic.